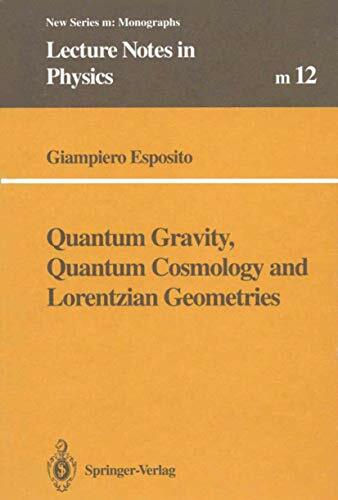 [PDF] Quantum Gravity, Quantum Cosmology and Lorentzian Geometries (Springer Lecture Notes in Physics Monographs) | Free eBooks Download - EBOOKEE! Description: Product Description: The first aim of this book is to describe recent work on the problem of boundary conditions in one-loop quantum cosmology. The motivation is to understand whether supersymmetric theories are one-loop finite in the presence of boundaries. The second aim of the book is to present a recent, entirely new study of the singularity problem for space-times with torsion. The book is written in self-contained form. In many cases problems have been initially formulated in the simplest possible way, and finally presented and solved at increasing levels of complexity. Readers will find here a detailed and updated study of quantum cosmology, its motivation, and application to perturbative quantum gravity. Moreover, this is the first book which enables the reader to learn techniques used in classical gravity and quantum cosmology. The second edition adds new material to both the text and the bibliography. No comments for "[PDF] Quantum Gravity, Quantum Cosmology and Lorentzian Geometries (Springer Lecture Notes in Physics Monographs)".